GeoLOGIC Systems chooses INT Toolkits to build next-generation Geological Analysis application. GLS wanted to produce a next-generation analysis application to address the complicated geology of most petroleum reservoirs. The application needed to include a complete suite of dip-constrained and general map, profile, well, and seismic interpretation methods, all incorporated into an efficient GLS workflow and user-interaction pattern. It was also necessary to concentrate GLS resources on the algorithmic implementation for a new concept called “geometry fields” — a set of attributes derived from rock structures. While computationally difficult, these fields enable the geoscientist to examine the bedding and distributions of dip, curvature, and strain implied by their interpretations. To maximize platform independence, GLS decided to write the new application in Java using INT’s J/GeoToolkit components. The complete suite of J/GeoToolkit functionality was integral to the success of this highly interactive and graphic-intensive application. J/GeoToolkit components ranging from drawing tools to seismic and well log management were rapidly blended into the GLS architecture. Sophisticated functionality was easily extended and provided the basis for developing new analysis methods and data presentations. By utilizing J/GeoToolkit for all the graphical components, GLS’ limited development resources remained focused on the most important areas for them — rapidly implementing practical new science in an easy-to-use framework. LithoTect “uncomplicates the complicated” and is quickly becoming the new industry standard for structural and stratigraphic analysis. Its depth conversion, well monitoring, and data projection capabilities are state-of-the-art. The structural restoration/forward modeling techniques include decompaction/isostacy and operate on both interpretations and seismic data — a unique breakthrough in geological analysis. 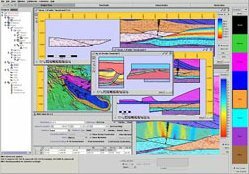 Easy for geoscientists to learn and use, the Java implementation enables LithoTect to run on all types of laptops and workstations. INT’s collaboration with LithoTect illustrates our dedication to providing solutions to efficiently build a complete, sophisticated, user-oriented application interface around our graphics toolkits. GeoLOGIC Systems, Inc. was started in 1983 to create the first, and still most widely used, computer program to undeform and restore geological structures. Now a part of Halliburton, GLS continues pioneering work in applications of structural and stratigraphic geology to petroleum and mineral exploration and production.